Corbyn’s rail re-nationalisation is the right first policy, but the devil will be in the detail. Margaret Thatcher didn’t privatise the railways. Her main intellectual guru on privatisation, Nicholas Ridley, didn’t think they should be privatised. It’s worth starting with those two facts when we look at Jeremy Corbyn’s first main policy announcement, the renationalisation of the railways. The problems of British Rail in the decades up to its privatisation in 1994, which can mainly be summarised as massive inefficiencies compared to continental systems, have not been solved by privatisation. Instead, more problems have been created, in particular the fragmentation of a service that it would make more sense to run as a whole, the highly confused ticketing process, with its many prices for the same journey, and the excess profits enjoyed by the owners of the franchises, which are, let’s not forget, enjoyed at the expense of the British public using what should really be seen as a utility (a necessity) especially given the desire by our governments for us not to use the car to commute, the difficulties of parking, and the congestion that would result if our rail system didn’t exist. Yet even the most committed ideologues could not deny that since privatisation there has been considerable innovation, punctuality standards have improved, and the railways are far safer. Furthermore, the amount of rail journeys taken has doubled. But here lies a classic cause and correlation conundrum. Would the above have happened anyway, even if the railways hadn’t been privatised? One side will argue no, that it was the pursuit of profit that incentivised the rail companies to make the investments that helped these advantages happen. The other side will argue that progress would have happened whether the service was privatised or not. They would also say that the raised number of rail users is a complete red herring. That didn’t happen because rail was better, but because the alternatives were becoming more expensive and time-consuming and, frankly, unfeasible. We will never know, because rail WAS privatised. What we need to think about is what should happen now. It will help to take the politics out of this, because politics means that both sides of this debate are shutting their ears and arguing that nationalisation or privatisation is the only way. Let’s concentrate on the economics of this. This will help us to get behind the claim that re-nationalisation of the railways will solve all the problems above. 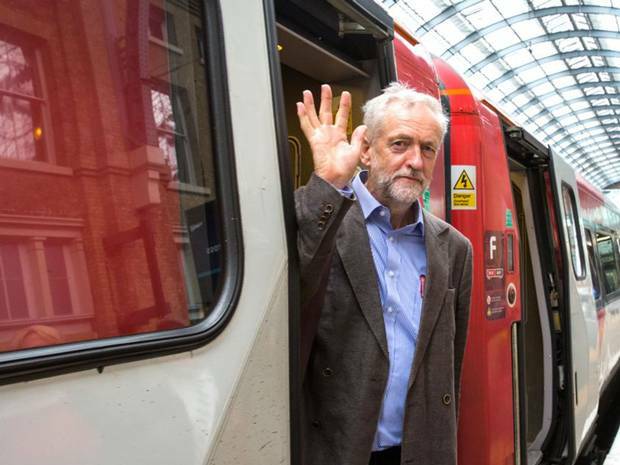 First of all, Corbyn’s policy is NOT forced renationalisation of the rail companies. It so happens that, under the privatisation method, there is a system of rail franchises, under which operating companies could bid to run a rail service (eg the Southern Railways service towards Brighton) for a period of time. Corbyn wants, when those franchises expire, to replace them with a publically run line until, one by one, all the rail operation franchises are run by the state. So here is the first bit of economics we need to understand. Privatisation was supposed to be about introducing competition into a market, to make companies within the market need to be efficient to compete, improving prices and quality. It was also aimed at making the management of the companies that resulted have to answer to shareholders, who had invested their own money, and would demand those efficiencies. The problem, spotted by Nicholas Ridley and Thatcher, is that each railway line is, in effect, a “natural monopoly“, meaning that competition is impossible, as only one company can be operating trains on it. To introduce operating competition, new tracks would need to be built, as different train companies on the same line would cause chaos. So, neither is possible, meaning the ONLY source of competition is when train operating companies bid to run the franchises. So, every few years, some large companies bid for the franchises on the basis of who pays the highest price (which they recoup in passenger fares, plus, it turns out, continued subsidies from the government). The rail regulator then monitors the fares they charge and the quality of service they produce. Things haven’t quite turned out as planned though. Not as many companies compete for franchises as was hoped, fares have gone up to the point where rail travel in Britain is three times the amount per mile than it is in France (where rail is still nationalised), and the government subsidy mentioned above, which was given as a reason to privatise, has now almost doubled from what it was in 1994. Which is how we are at a point where re-nationalising the train operation has some economic justification. Prices haven’t fallen, so competition hasn’t really worked there, and the key issue is that we now have many companies operating, who miss out on what is known as ‘economies of scale’, which are where costs fall as output rises. Put simply, if rail were operated as one public company, the ability to bulk buy, the cheaper finance available and, the ability to have one management team instead of, for instance, many different HR directors, would cut the cost per passenger and those cuts in cost could be passed on in lower prices. So you might think that re-nationalising the railways is thus the simple answer. Many on the left would have you think that and in a way the above has made a strong case. The trouble is that there are problems with nationalisation too. Just because privatisation hadn’t been the answer doesn’t the an nationalisation IS the answer. The first problem is the process, and the second is about assumptions. In one sense, the process has been thought through pretty well. Because the franchises are being allowed to run out before being taken back into public ownership, re-nationalisation will be cost-less. This differentiates rail from the energy industry, where the government would have to spend billions buying out shareholders. Yes, this will mean that after 5 years of Labour government, in 2025, two thirds of rail services will still be in private hands. But, if you feel something is right, you can afford to be patient, and if the first public run franchises are a success, pressure will come from the public for it to speed up, which, I imagine, is the idea. That said, as Jeremy Corbyn may be finding out, turning popular ideas into the flesh and bone of an implementable policy is harder than you think. For instance, the effect on the privately run rail services of the fact that the franchise will go back into public hands may be that they don’t invest in improving the quality of the services they provide, which could, in the short term, affect the customers. Again, though, just because there could be some problems during a transition from the wrong system to the right system doesn’t mean that transition shouldn’t be made. Perhaps investment should be subsidised by the government during that time. The big question is this. Will nationalising the rail service provide more investment, more innovation and lower prices? The answer is that it depends. Can they find sufficient expertise to run the service as well as possible? Will public servants, with no competitive pressure, really push as hard for innovation and lower prices. The assumption from the left, is yes. The evidence from history is no. Nationalisation isn’t the panacea for all the ills of a privatised utility. At least, with Jeremy Corbyn’s plan, he will give it time to try and get the medicine right. Given all the possible policies Corbyn could have chosen to announce first, I think he has probably gone for the one his party has most belief in, so is least controversial, whilst still ‘keeping it real’ in terms of the democratic socialist Britian he is really trying to achieve. Lot’s of good points here – balanced as always. A lot of people don’t understand the concept of ‘natural monopolies’ like a train route on which only one company can realistically provide a service – and unfortunately the fanatic ideologues of the Thatcher/Blair/Cameron project don’t seem to accept your point – for them ‘private’ is best in all circumstances regardless of whether it makes things better for people (as long as it makes profits for a few). Similarly for some on the left the state is always better and private is always bad regardless of whether it improves things etc. blah blah blah… You ask, “Can they find sufficient expertise to run the service as well as possible? Will public servants, with no competitive pressure, really push as hard for innovation and lower prices. The assumption from the left, is yes. The evidence from history is no.” – OK – but what about the evidence from other countries? I don’t claim to be an expert – but you mention the French railways – generally considered to be good. What about Switzerland, Germany, Austria etc.? Are these nationalised networks? Are they subsidised? If people think that Labour want to take us back to the days of British Rail just prior to privatisation then they’re doomed – and so are our trains – but if they can present a vision of a brilliant national public transport network then things could improve for everyone. Is there a reason why we can’t aim to be like these central European social democracies who seem to be able to find the right balance of what should be private and what should be public? Just to add to your comment, I forgot to point out that some of the owners of the franchises are….state rail networks in other countries! The problem is that I am comparing what is possible with a nationalised service now wth what was possible in the 1960s and 1970s, when a combination of a government ideologically committed to full employment and the unions exploitation of that under the laws that didn’t exist at the time made it extremely hard to produce anything. I wonder if a desire to get this right and prove the concept that a nationalised rail service can work that they would work as hard as they can to make it work. Hence the GNER nationalised rail franchise did so well when taken back into state hands off national express. We may well see!